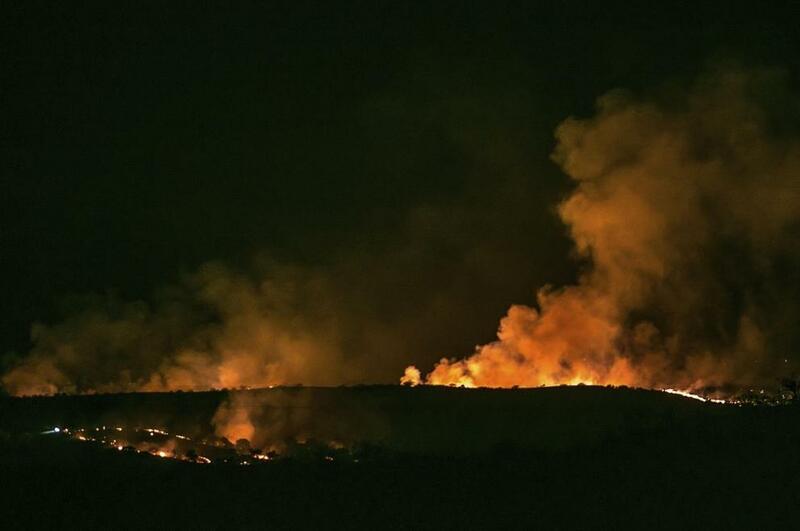 A wildfire, dubbed the Sawmill Fire, was started at the gender reveal party of a Border Patrol agent. The blaze took place in April of 2017 at the off-duty U.S. Border Patrol agent's party that set off a 47,000-acre fire. The off-duty agent didn't mean to start the fire, according to an affidavit filed last week. The party was meant to reveal to his family and friends the gender of his soon to be born child. 37-year-old Dennis Dickey pleaded guilty to a misdemeanor charge stemming from starting the fire which burned nearly 50,000 acres. The incident occurred on April 23, 2017, when Dickey and his group traveled to Green Valley, Arizona so he could set up the ultimate reveal. Little did Dickey know, the plan that was simply meant to reveal his future child's gender would turn into a criminal record and hundreds of thousands in damage. Dickey will be required to pay $220,000 in restitution after he pleaded guilty in federal court. Nearly 800 firefighters from multiple agencies were needed to battle the Sawmill Fire for almost a week. The actual cost of the fire when including the money spent battling it amounts to about $8.2 million. The fire started when Dickey shot an explosive target that contained Tannerite which is designed to explode when shot. U.S. Forest Service Special Agent Brent Robinson said the substance is designed to detonate when shot by a high-velocity firearm in an affidavit filed September 20 in U.S. District Court. The explosion was even caught on video by a guest who was filming the gender reveal. Although Tannerite is a legal substance, it has been linked to multiple wildfires, especially in Western states. Dickey's attorney, Sean Chapman, said the explosive target was their way of celebrating his wife's pregnancy. The explosive Tannerite was specifically chosen to explode with colored powder which would reveal the gender, blue for a boy, and pink for a girl. "Dickey immediately reported the fire to law enforcement, cooperated, and admitted that he started the fire," Robinson said in the court affidavit. The plea agreement that Dickey agreed to will mean he will pay $100,000 in restitution when he is sentenced on October 9. Dickey will also be required to pay another $120,000 in monthly installments of $500 for the next 20 years. He has also been sentenced to 5 years of probation as a part of the plea agreement. The 37-year-old Border Patrol agent told U.S. Magistrate Judge Leslie A. Bowman, "It was a complete accident. I feel absolutely horrible about it. It was probably one of the worst days of my life." Dickey's attorney said Dickey will borrow from his retirement fund to pay the $100,000 that is due on October 9. Chapman said that ordering Dickey to pay $8.2 million to cover the cost of the fire would have been "like getting blood from a stone" because he would never be able to pay that much. He also maintains that his client did not set the fire intentionally which meant he couldn't be charged with arson. The plea agreement that Dickey pleaded to was a lesser offense and Chapman said that the Border Patrol agent will most likely be allowed to keep his job. The Tannerite explosion took place on state-owned land near Madera Canyon and tax-payers will be left to foot the $8 million that Dickey can't pay. The fire spread quickly from the surrounding Santa Rita Mountains foothills to Forest Service and Bureau of Land Management land. The fire also affected some areas in the Empire Ranch and at its peak, it forced Arizona 83 to close completely. Chuck Wunder, chief of the Green Valley Fire Department said the National Weather Service issued a fire watch for that day. The fire watch includes a red flag warning that "conditions are ideal for wildland fire combustion and that there is potential for rapid spread," according to Wunder. No one was injured by the blaze and no structures were destroyed but the fire did cause some homes in the Greaterville and Singing Valley areas to be evacuated with hundreds under pre-evacuation orders.